Trying to declutter your home? Welcome to our list of the best time management books and organizing books out there! There are tons of books about organizing on the market. I created this page to save you some time...so you could be reading the book instead of searching for it, or better yet, you could be organizing! Below is the list I compiled of the top 20 organizing books. Enjoy! 12. What's a Disorganized Person to Do? 17. Clutter Rehab: 101 Tips and Tricks to Become an Organization Junkie and Love It! [BONUS] Here's another FANTASTIC organizing book by Barbara Hemphill. 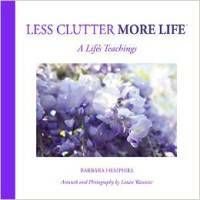 Less Clutter More Life is a gentle yet powerful book on organizing your space and your soul.